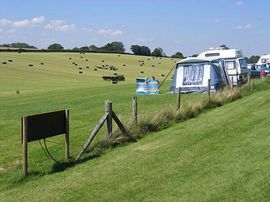 Kilmeston is set in the rolling hills of the South Downs, known as an area of Outstanding Natural Beauty. 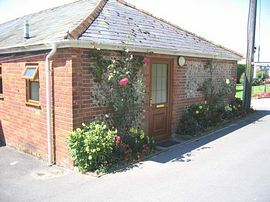 We have converted a large old farm building into two, comfortable three bedroom bungalows which are fully equipped for self catering holidays. The fitted kitchen has a cooker, fridge, microwave, washer/drier, coffee maker, toaster and a high hair if required. The Living/dining room has a colour television and the usual range of furniture. In the main bedroom there is a double bed and a cot if required, the second bedroom has two single beds and there is one single bed in the third. 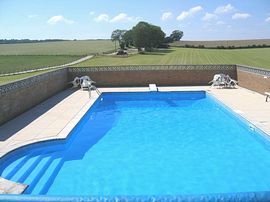 On the Farm there is a walled 20' x 40' swimming pool complete with diving board, the pool is heated from around June to August. There are accompanying changing rooms with toilets and showers. 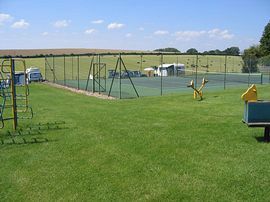 Next to the swimming pool there is a full sized tarmac tennis court, and a grassed play area with swings, slide, roundabout, climbing frames, see-saw, rocking horse and trampoline. All of this is set in 90 acres of farmland surrounded by walks and scenery. Close by is the picture postcard village of Cheriton and Alresford which has a main train station for the famous watercress line. Part of the Weyfairers Walk. 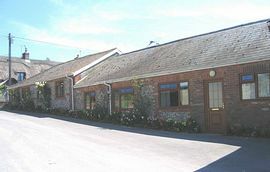 Kilmeston is about 10 miles east of the ancient capital of Winchester, off the Petersfield road which is the A272. At the crossroads with Cheriton/Alresford and Kilmeston take the Kilmeston road for 2 miles, going through the village and up the hill you will find College Down farm on the right hand side. June, July and August: £412.00.